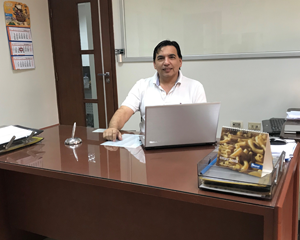 Mr Calabi, engineer and general manager of Inpastas, answers our questions pointing out the reasons why the Bolivian Company – already owning large dry pasta production lines - chose Storci for such an important project like Instant Pasta. Could you tell us briefly about your Company? Inpastas was founded in 1992 in Santa Cruz de la Sierra, aiming to produce a high quality pasta affordable to Bolivians. 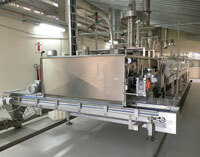 We also wanted to make pasta that could be competitive worldwide. Reaching these goals, as well as witnessing our children growing up eating our pasta, are sources of pride and motivation to go on with our project. How come did you make up your mind to make instant pasta? Our attention was drawn by the fact that lately quick and ready meals have been more and more requested, although we were not in favour of noodles that, as you certainly know, are usually fried foods. 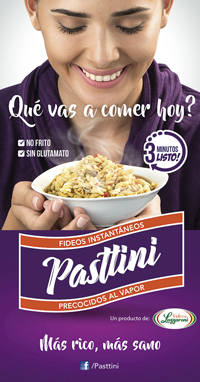 For this reason, when we heard about Storci’s instant pasta, as a healthy alternative to noodle, we decided to count on this Company and started to produce Pasttini brand, the first and unprecedent instant pasta product in Bolivia. Which are the main features of your Pasttini? 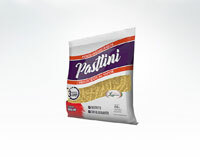 Passtini is vapour pre-cooked pasta, thus not fried. That’s its main feature. It is a short pasta soup. For this product we have created flavours with no glutamate, either standard (such as beef and chicken) and new ones, based on unusual ingredients such as peanuts Pasttini…and many more. We like their innovative approach and the fact they always look toward the future; we have known this Company for years, as they are one of our most important suppliers; consequently we chose to rely on them to face this new challenge". 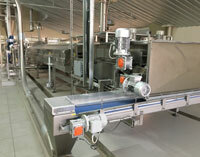 We want to go on with the instant pasta business, aiming to reach a genuine and healthy food. For this reason we have decided to make instant pasta using an important amount of quinoa, chia and bran flours reaching excellent results.